Home › Home News › Help 5000 children get at book! This Christmas we want your help to distribute 5000 young reader books written by kids with disability, about life with disability, to schools and libraries across PNG. With more than 85% of PNG’s population living in remote or rural communities, for most children, education during the vital early years of life is inaccessible. For children with disability, these opportunities are even rarer. Barriers such as accessibility, costs, and discriminatory attitudes mean that children with disability are often excluded from education. More needs to be done to ensure all children, especially those with disability, have access to quality education. We want your help to change that. 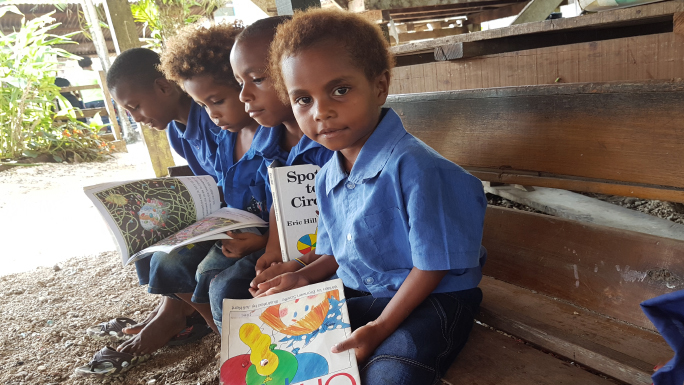 We want to distribute 5000 young reader books written by kids with disability, about life with disability, to schools and libraries across PNG. It’s not all about giving, in return for your donations, you can know that lives will be change and books will be provided. Each book costs just $2.05- less than a cup of coffee. Our crowdfunding campaign runs until January, but our target is to raise just over $10k by Christmas. This means we have to act now! Here’s the link to our campaign: Help 5000 children get a book! Please give what you can, share to social media and send out an email to your friends, colleagues and clients this week, with a link to this video: Help 5000 children get a book! introducing them to the challenges for people with disability in PNG and establishing the need for these books. P.S. Please note that the crowdfunding site ‘chuffed’ automatically asks you for an additional donation for their site – you do not need to do this, just type $0 into the box.